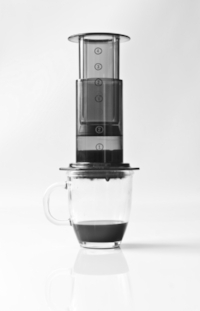 AeroPress - The best and easiest way to home brew? The rise of the AeroPress as one of the best ways to make coffee continues. I have many customers now praising this simple, inexpensive and efficient gadget as the best way to make a satisfying cup of coffee. Brewing with an AeroPress is a process that is simply mastered whether brewing the right way up or by using the inverted method. YouTube is awash with videos demonstrating the various methods. Once you have used an AeroPress to brew coffee you will find that your cafetière will soon be gathering dust at the back of the cupboard. If you are a latte drinker then adding the Bodum Latteo milk frother is an useful addition. Keen gardeners will find the ease of ejecting the coffee puck after brewing makes the coffee grounds a great addition to compost, where their nitrogen content can be fully realised and used. ©2019 bean miles. All rights reserved.